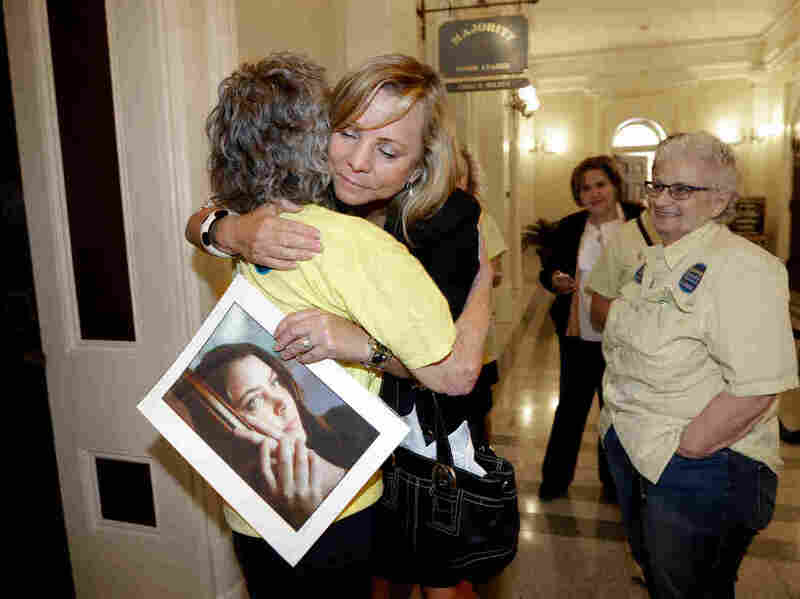 California Governor Signs Landmark Right-To-Die Law : Shots - Health News After months of impassioned debate over the ethics of physician-assisted suicide, California will become the fifth state to allow people who are terminally ill to hasten death with lethal drugs. Debbie Ziegler holds a photo of her late daughter, Brittany Maynard, after the California State Assembly approved a right-to-die measure on Sept. 9. Maynard died on Nov. 1, 2014. "I do not know what I would do if I were dying in prolonged and excruciating pain," he wrote. "I am certain, however, that it would be a comfort to be able to consider the options afforded by this bill. And I wouldn't deny that right to others." One of the key co-authors of the legislation, state Sen. Bill Monning, a Democrat from Carmel, Calif., said the signing "marks a historic day in California" and called the governor's thoughts "a powerful statement." Brown's signature concludes a hotly contested, 10-month debate that elicited impassioned testimony from lawmakers, cancer patients who fear deaths marked by uncontrollable pain and suffering, and religious and disability advocates who fear coercion and abuse. Marg Hall, an advocate with the Bay Area disability rights group Communities United in Defense of Olmstead, said she was "disappointed" and "worried." "Given the level of dysfunction and injustice that exists currently in our health care system — with many people without insurance still, with the very underfunded ability of people to have choices for treatment and care — adding this very potentially dangerous tool to the mix is of great concern to people with disabilities," Hall said. Marilyn Golden, a policy analyst with the Disability Rights Education and Defense Fund, also strongly opposes the new law. It lacks safeguards, she said, adding that she fears abusive heirs or caregivers could "steer" patients toward assisted suicide. But U.S. Sen. Dianne Feinstein, a Democrat from California, said Brown made the "absolutely correct" decision. "I've seen firsthand the agony that accompanies prolonged illness, for both patients and loved ones, and this bill provides a compassionate, kind option," Feinstein said in a prepared statement that emphasized the law's safeguards. Dr. Robert Liner, a retired obstetrician who is in remission from lymphoma, said he was thrilled with the governor's action, having fought for this change for many years. "It has been a long road," Liner said. "I'm really glad Gov. Brown stepped up to the plate and signed it." Liner is part of a lawsuit seeking the right of doctors to avoid liability for prescribing lethal medication to terminally ill patients. Liner said he doesn't know what he will do when he reaches the time to make a decision about his own life. "But I really think it is important to have an option," he said. "I am delighted." The new law requires two doctors to determine that a patient has six months or less to live before the lethal drugs can be prescribed. Patients also must be physically able to swallow the medication themselves and must have the mental capacity to make medical decisions. One of the meetings must be private, with only the patient and the physician present. That requirement is aimed at ensuring the patient is acting independently, Monning said. Patients must also reaffirm in writing that they intend to take the medication within 48 hours. Golden called these safeguards "hollow." She said none of the states — including California — that have legalized this option require a witness at the death. When asked if opponents would be monitoring implementation of the law to ensure there is no abuse, she said her group "is not taking any options off the table right now." The law will take effect sometime in 2016 — 91 days after the special legislative session, which is still ongoing, concludes. At that time, California will become the fifth state to allow physician-assisted suicide. Oregon, Washington, Montana and Vermont permit the practice. It was permitted in New Mexico until August, when an appeals court in the state reversed a lower court ruling that had established physician-assisted suicide as a right. The New Mexico Supreme Court is now hearing that case. Perhaps the most visible face of this law is Brittany Maynard, the 29-year-old California woman who suffered from terminal brain cancer and moved to Oregon explicitly because it permits aid in dying. Maynard used the law to end her life last November. In an interview Monday, her widower, Dan Diaz, said he felt "an enormous sense of gratitude" that the bill has been signed into law. He said his wife would have felt "relief ... for all terminally ill Californians — that they have that bit of control." Elizabeth Wallner, who lives in Sacramento and has stage 4 colon cancer, said she felt a "a great sense of relief. ... I don't want to die," she said, but "having the option is really powerful." The legislation started out as SB 128, a bill introduced in January. That bill cleared the California Senate, but ultimately stalled in the state Assembly in July. The authors then introduced a similar bill in August, during a special legislative session called by Brown this summer. The California law is set to expire in 10 years, unless the Legislature passes another law to extend it. This story was produced by member station KQED's blog State of Health, with reporting contributions from Anna Gorman, a senior correspondent with the NPR partner Kaiser Health News.